The eggplant is native to the region along the Silk Route…. India, Pakistan, and Nepal which reaches all the way to Turkey. 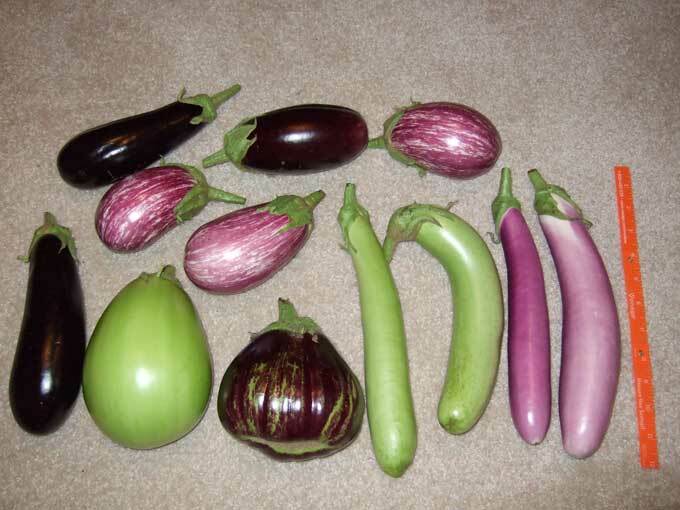 I am sure you have seen several varieties of eggplants, long and skinny, purple and big, pink and white and the one I will be cooking today is a small oblong one perfect for stuffing. That is the one on the top middle in the photo. The actual name for this dish is Imam Bayaldi, which is a Turkish eggplant dish stuffed with tomatoes, onions and garlic. Turkish cuisine is a polyglot of many different cultures… Persian, Central Asian, Mediterranean and Balkan. Along the Mediterranean is where you will find dishes abundant in vegetables, garlic and olive oil. What I love about Mediterranean cooking is that the ingredients are so simple to the staple Mediterranean diet and yet so flavorful. The addition of mint to this dish is an unexpected freshness that creates a symphony of delightful surprise. Make a slit, lengthwise, in each eggplant without opening the ends. Soak the eggplants in a container of cold water with 2 tablespoons salt for 20 minutes. Drain, rinse, pat dry and set aside. In a large skillet, heat ¼ cup olive oil over medium heat and slightly brown the eggplants on both sides. Arrange the eggplants side by side on an oiled baking dish. In the same skillet, heat 2 tablespoons oil over medium heat and add the onion and garlic. Sauté 5 minutes. Add the mint, salt, sugar, ground cumin and tomatoes for the filling and sauté for another minute longer. Remove from heat. Open up the slits in the eggplants with your hands and stuff each eggplant with the onion mixture. Drizzle the remaining oil and ¼ cup water over them. Cover with aluminum foil and bake for 1 hour or until soft. The intricate flavors of this sweet and spicy dish result in a culinary delight. You can add vegetables of your choice to this dish for a larger crowd or just stick to the straight forward recipe; either way you will love it. Best if served accompanied with a wild rice dish. 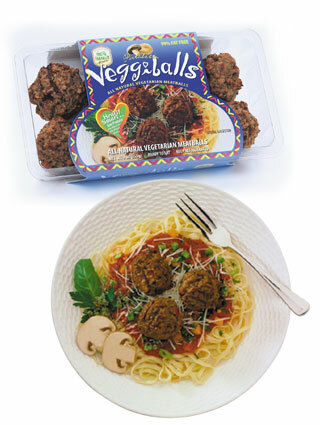 These meatballs are made from Portabella mushrooms by the brand Franklin Farms available at many major supermarkets in the refrigerated section. I bought these meatball at Waldbaums. You can always go online and see which stores carry it. You will find a picture of the brand below. In a medium saucepan over a medium high flame, heat oil and sauté onion for 7-8 minutes or until translucent. Add the tomato sauce, curry, cumin, turmeric, duck sauce and orange juice to the saucepan and combine well. Cook for 5 minutes. Add zucchini, potato and carrots or any cut up vegetables of your choice and combine well. Once boiling, lower heat and simmer covered for 25 minutes. Add your meatballs and cook for an additional 12 minutes. When my friend Melisa who is from Puerto Rico told me about Pastelon, which I never heard of, I was only too eager to try it. Who ever heard of a lasagna made from plantains?? Just a couple of weeks ago, Melisa came over to my place and we spent the next few hours preparing this dish. What is most time consuming is baking the plantains because you end up doing it in batches. Typically the plantains are fried and is made with layers of beef Bolognese, however I created a healthier version by instead baking the plantains and using “Trader Joe’s Soy Chorizo” for the sauce. Most latin countries have their version of chorizo, which is a type of sausage, this one is a Mexican chorizo that has the consistency of ground beef, though drier, due to a higher chile and spice content. It’s important to use ripe plantains for this dish, because when ripened they are sweeter and softer. This dish is amazing with a sweet and spicy savory flavor that blends together into a culinary bliss. Use the blackest, scariest looking plantains you can find. If you can’t find these looking like the photo, then ripen in a brown paper bag for 10 days. The outer layer of a plantain is tough and thick. To peel, start by slicing off both ends. Make an incision lengthwise down the “back” of the plantain with a sharp knife. Be careful not to cut into the fruit. Once the incision is made, open the peel and cut into the plantain lengthwise at 1/2 inch slices. 2. Coat a nonstick cookie sheet with cooking spray. 3. Arrange cut plantain in single layer and coat tops with cooking spray and salt to bring out the full flavor. 4. Bake, turning once for 10-15 minutes, until plantains are golden brown and very tender. 5. Once done, set aside on a plate as they will be used to layer the lasagna. 6. Lower the oven temperature to 350°F. 7. In a large frying pan, under medium high heat fry the onion in oil. After a few minutes, when the onions are softening, add the pepper and stir for another few minutes. 8. Add the Soy Chorizo and 1 cup tomato sauce to the mixture and stir well. Reduce heat to a medium flame and cook covered for another 5-7 minutes. 9. To assemble pastelon: Take your prepared rectangular pan and spread out ¼ cup tomato sauce. 10. Then a layer of plantains, then chorizo mixture, then a fistful of cheese, repeat. 11. You want to finish with cheese and plantains. Most likely you will get three layers. 12. Beat eggs with milk and pour over the pastelón. Let it sit for a minute allowing the egg to soak in. Top off with just a bit more cheese. 13. Bake in oven for 20 minutes.